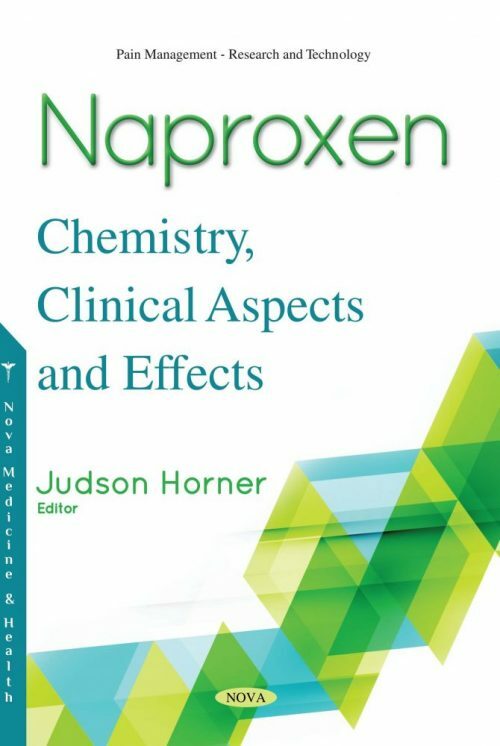 In Naproxen: Chemistry, Clinical Aspects and Effects, a compilation of the research developed in the past decades on synthetic receptors for naproxen is presented. Naproxen receptors proved their usefulness in chiral separation of the racemate and in other instances of supramolecular chemistry and pharmacy. The particularities, the achievements, the strengths and the weaknesses of the naproxen receptors produced up until the present are assessed. Next, the interaction of (S) and (R)-naproxen with chiral donors in linked systems – dyads are described. These model systems are believed to simulate NPX enantiomers binding with chiral amino acid residues located in active sites of COX 1, 2. According to the authors, some kind of diastereomers analogs are formed upon binding. In one chapter, the occurrence of naproxen in different aquatic environments, its environmental fate and the typical pseudo-persistency, as well as its effects on different ecosystems are discussed. The nonsteroidal anti-inflammatory drug naproxen is a polar compound that has been detected in concentrations ranging from ng to µg per litre in surface waters and in wastewater treatment plant effluents. This pharmaceutical is absorbed by the organism after intake and is subject to metabolic transformations. In the closing study, two fixed-bed reactors (working volume, 3 L each) containing the white-rot fungus Phanerochaete chrysosporium immobilized on wood chips and operated under submerged and countercurrent-submerged modes were used to remove naproxen (at 1 mg/L) from the artificially contaminated water. The reactors were operated under the intermittent feeding and continuous aeration mode to find a strategy for a stable reactor operation under non-sterile conditions.